What should we do if your cruise is canceled in the last minute ? You’ve got a good deal and now are dreaming about an interesting trip with beautiful cabin, delicious food, friendly staff waiting for you in Halong Bay, Vietnam. You’ll be relaxing on the sundeck while the boat cruises around the rising islands in the fresh air and quiet atmosphere. Your dream smells when you arrive at the dock and the local authority announces that all cruises are canceled due to the weather conditions while it is still sunny! Is this a joke? you may think. 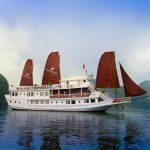 But it happens quite often to the cruises in Halong Bay, a world heritage site in Vietnam, epecially during the summer time from May to August. So what will you do? If this is the first time you come to Vietnam, you may be down from the heaven to the hell as it takes 3 hours and a half by bus from Hanoi to Halong Bay already and it will take that time to return Hanoi again. – Contact your cruise’s operator, tour guide or your booking travel agent to check if your money will return to your pocket. 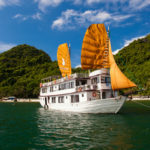 Normally, it will be back to you in full if you book reputable cruises such as the Red dragon cruise, Oriental sails, Emotion cruise… But in some cases, the cruise or travel agent can ask you for a little support by paying the bus trip or booking fee which is just a small money since the situation is out of their hand. 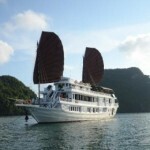 – Stay overnight at a hotel in Halong City then book a day trip to visit Halong Bay in the next day. This will be a good choice if the weather seems to be better in the coming day. 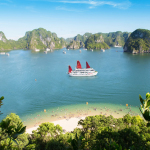 All hotels in Halong Bay can help you with the booking. You should check some recommended hotels before you go! – Ask the cruise or travel agent if they have any alternatives. There are some other places near Hanoi that you can visit in one day such as Tam Coc – Bich Dong in Ninh Binh which is considered “Halong Bay on land”, or Perfume Pagoda which is also a beautiful place. – Return Hanoi and enjoy another night in Hanoi. Although many people don’t like Hanoi but if you just try a little bit with help from hotel receptionist or local people, you may find something interesting such as a cyclo tour through 36 streets in the old quarter of Hanoi, a water puppet show at Thang Long theatre or just a cup of famous Vietnamese coffee at a cozy restaurant to enjoy the daily life with local people. No mater what alternative you can come up with, just prepare your mind before you get in the car and enjoy your trip! Please feel free to contact us ! We are always with you.